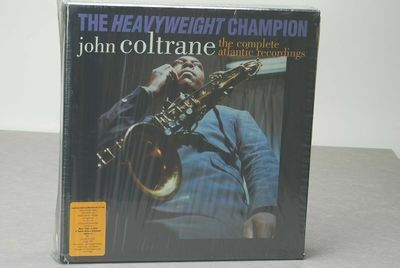 John Coltrane "The Heavy Weight Champion-The Complete Atlantic Recordings" US Limited 3.000 Set only Twelve Vinyl LP Numbered Box Set Rhino USA RARE Strictly Official Authorized Limited Twelve 150 Gram Vinyl LP (Incl. "Outtakes" Gatefold Double LP Set in Box , Vinyl Version Is only Issued by Rhino Records. with Each Plain Vinyl Inner Sleeve in Each Coating Style Picture Sleeve and 44 page Linernotes Booklet incl. Interviews, Recording Data. All Contents Are in Designed Box Numbered (# 357/3000) The double LP Outtakes sleeve was printed as a distressed Reel to Reel Box. I would like to point out 3 points of distress shown in photos that came that way upon purchase. 1. The Coltrane Plays the Blues cover has a slight upper left corner crease. 2. Legacy has a tear along the edge. 3. My Favorite Things has a tear along the edge. These covers have a unique to the Rhino edition glossy finish. Still has the original sealed plastic plus a heavier plastic that I put over the original. I only cut open the end but never played the records. Shipping to the Lower 48 states Media Mail and Insured.